Faster validation of suspicious activities. Better, more accurate alerts. Quicker click-through to critical data. The newest release of SAS® Anti-Money Laundering goes further than ever to help analysts in financial institutions comply with anti-money laundering (AML) and counterterrorist financing regulations. The updates enable users to monitor more risks within even larger data volumes – and do so in minutes. Among respondents to a 2016 SAS and Longitude financial crime survey of 120 banks, 19 percent had been fined by regulators or law enforcement agencies in the past three years – of those fined, 22 percent faced penalties of $1 billion or more. Fines like these can cause serious reputational damage. They ramp up pressure on banks to investigate and address suspicious activity swiftly, a process complicated by high transaction volumes from online and mobile banking. Transparency – Regulations demand banks explain their risk monitoring and prioritization strategies. SAS’ transparent environment clearly describes how alerts are generated and provides tools to analyze the distribution of data and efficacy of monitoring strategies. Visualization – SAS empowers users to change, author and test scenarios quickly. The streamlined user interface makes crucial information more readily available to analysts so they can quickly document cases and move work items through the decision-making process. Flexibility – SAS monitoring techniques are openly documented and backed by proven statistical methodologies for scenario deployment. The extendable and flexible SAS data model adapts to new lines of business, new client types or emerging risks. Consistency – SAS’ enhanced structure manages alerts and investigations centrally while preserving data security. This multitenant approach can reduce the cost of compliance and provide an enterprisewide view of risk exposure. 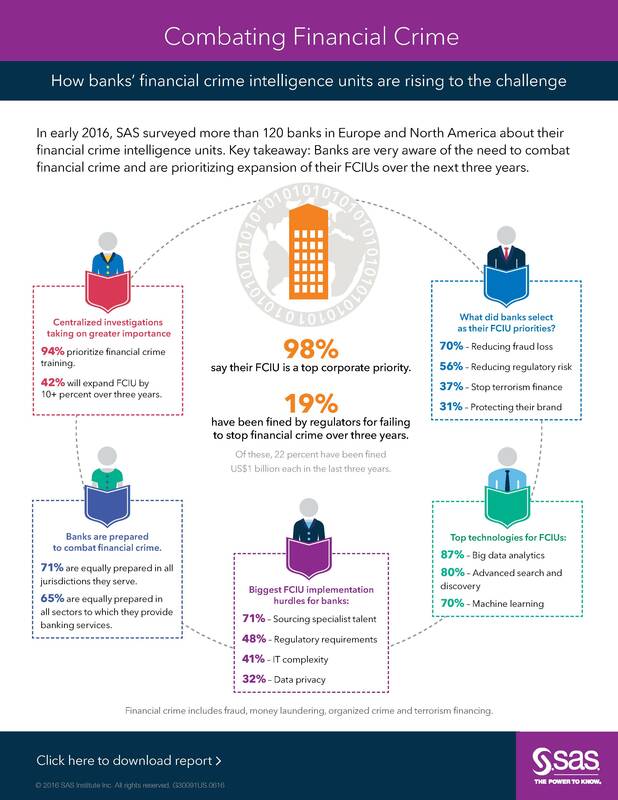 To learn more, visit the SAS Anti-Money Laundering web page or download the white paper about the increasing importance of financial crimes intelligence units in banking. SAS is the leader in analytics. Through innovative analytics, business intelligence and data management software and services, SAS helps customers at more than 80,000 sites make better decisions faster. Since 1976, SAS has been giving customers around the world THE POWER TO KNOW®. SAS and all other SAS Institute Inc. product or service names are registered trademarks or trademarks of SAS Institute Inc. in the USA and other countries. ® indicates USA registration. Other brand and product names are trademarks of their respective companies. Copyright © 2016 SAS Institute Inc. All rights reserved.